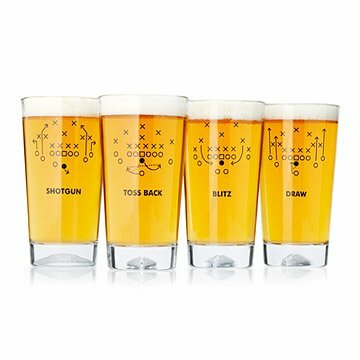 These playbook-inspired glasses give shotgun, toss back, blitz, and draw new meaning as fun drinking terms. Printed with simple graphic illustrations of classic football formations, these playbook-inspired glasses give shotgun, toss back, blitz, and draw new meaning as fun drinking terms. Armchair coaches will also get a kick out of the football imprinted into each base, making every game feel like the Super Bowl. Glassware made in the USA; decorated in Lawrence, Kansas. Great gift for any football lover! The glasses are lovely. The plays shown on them are entertaining, but the thing my brother-in-law and I liked best are the football-shaped indentations at the bottom of each glass. That's a really unique touch! Great for football /sports parties. I love the design on these glasses. Most sports glasses will have a logo on them but these are very cool because they have actual plays on them which makes a guy excited about getting them! Of course my boyfriend had to make sure the plays were legit and they are. You won't find these anywhere else and they are worth it especially come football season! Both sets of glasses fit the man who buys what he wants and needs, which makes find a good gift difficult. Excellent quality. Has a little football imprint in the bottom of the glass. So perfect. Extra glasses are a must during football season. these will be the first glasses served.